Born in 1870, this ~1820 sf farmhouse was the bees knees for its time. Sited on .73 of an acre overlooking a trout stream. 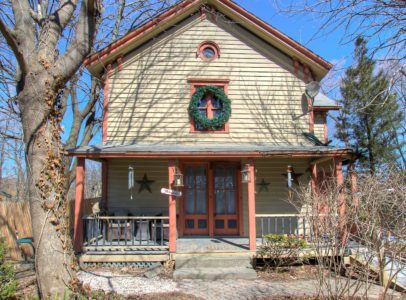 Many original details remain in place such as hemlock floors, tongue and groove, unfinished attic space revealing original timbers, windows, rocking chair porch . . . Separate retail space needs complete renovation. Garages. Zoned mixed use. There’s work to be done with great potential in up and coming Hillsdale, NY. Less than 10 minutes to the Berkshires. Asking $178,000.